One of the largest wireless carriers in the USA, Sprint is having a big trouble lately to manage the Galaxy S10 users. Since the release of the 10th anniversary edition of Samsung Galaxy S series, Sprint customers are facing numerous network and LTE/data connection issues. Sprint officially acknowledged the glitches and posted a knowledge base article in their community forums. They tried to push an intermittent bugfix update at the end of March, but it was not effective for most of the users. The carrier also admitted the chance of potential hardware faults in some units, and suggested users to opt for RMA. If the device just stays in permanent Voice and/or Data loss, updating the software will not help. There is no troubleshooting workaround to fix this. If you have a device that is in permanent Voice/Data loss, you will need to exchange the device per normal policies. 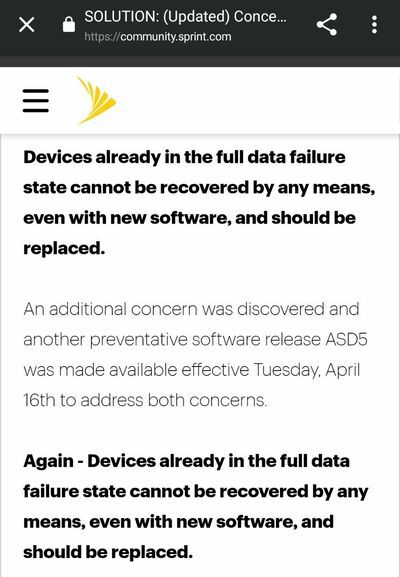 4/12/2019 UPDATE: As always, Sprint and Samsung continue to closely monitor concerns about intermittent or total loss of voice or data with the Samsung Galaxy S10, S10+, and S10e handsets. There will be a software release available on Tuesday, April 16th that will prevent the device from experiencing intermittent voice or data. Please update your device as soon as this release becomes available. And looks like they are right on their time! Samsung Galaxy S10 Plus users on Sprint network are reportedly getting a new OTA with LTE related fixes. The full version number of this new update is G97xUSQU1ASD5; the value of x can be 0 for Galaxy S10e, 3 for Galaxy S10 and 5 for Galaxy S10+ (as seen in the screenshot). For detailed clarifications of these characters, see here. The last four digits (ASD5) signify that the build is even newer than the one other US/Canada based carriers are rolling out aka ASD3. 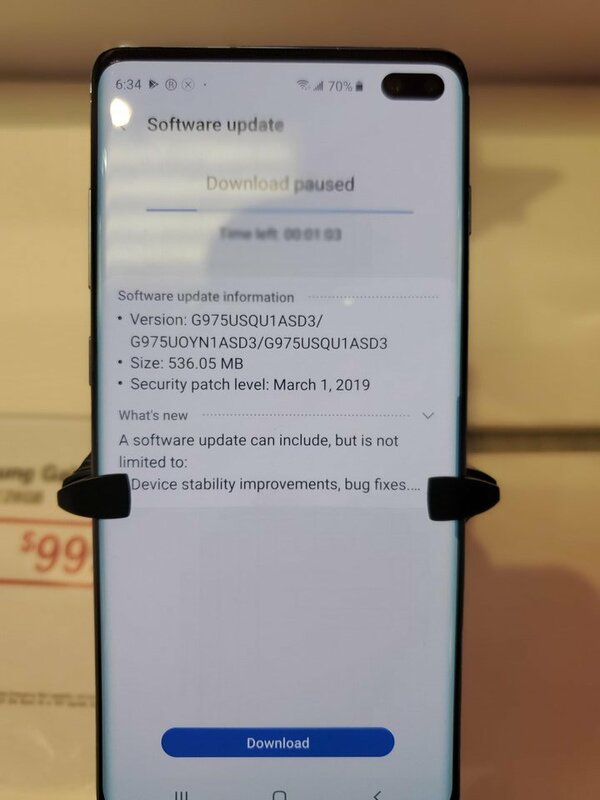 The newest OTA update also comes with April 2019 security patch level, which makes Sprint the first US carrier to deliver the monthly security patch. To the contrary, Canadian carriers have started to distribute the March OTA merely a day ago. Comment from discussion imdatking’s comment from discussion "Sprint S10+ update, includes improvement to LTE and April security patch.". My fingerprint reading is instant. Thank you Samsung! I wonder what else under the surface it improved?? Wouldn’t been nice if it optimized other features too. It’s worth mentioning that the recent Pie update for Galaxy S8 from Sprint also broke cellular network and/or LTE data connectivity for maximum users. 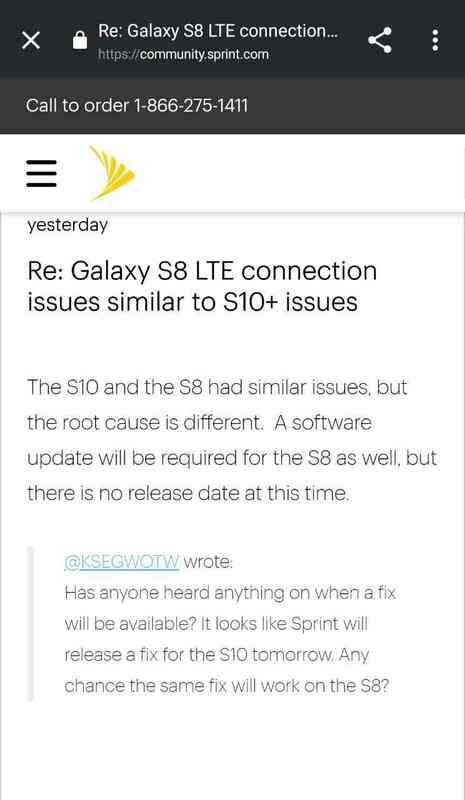 Sprint customers were curious to notice the similarities between the issues, but a Sprint Community Manager confirmed that “the root cause is different”. How many of you are planning to switch from Sprint due to these network issues? Let us know by commenting below. Sprint users are still facing the network glitches, even after upgrading to the build. Read this article for further details. Sprint has officially announced to replace the Galaxy S10 units having LTE/data connection issues. Meanwhile they pulled back the Android Pie update Galaxy Note 8 for similar bugs. Details here.